What to eat and do to age well, naturally! Eating more fruits, like berries and citrus fruit, and vegetables, like leafy greens and squashes. Take a quality, natural supplement containing antioxidant rich plant extracts, like Bee Prepared Immune Support Daily Defence or Max Strength. The balance between Omega 3 and Omega 6 Fatty acids is important for anti aging by reducing inflammation in the body, supporting cognitive function and for maintaining cellular. Ideally the ratio should be between 1/5 to 1/2 (Omega 3/Omega 6). When consuming the typical ‘Western Diet’ this ratio can be 1/16. Reducing processed, refined foods and take aways in your diet. Eating fresh oily fish like wild salmon, mackerel, haddock and sardines 3 or more times a week. Cooking with coconut oil as an alternative to butter, margarine and other oils. Find ways to manage stress. Stress hormones have natural immunosuppressive actions. Eat immune supporting nutrient rich foods containing zinc, B vitamins, vitamin C and flavoioids. Ensure Vitamin D levels are adequate. 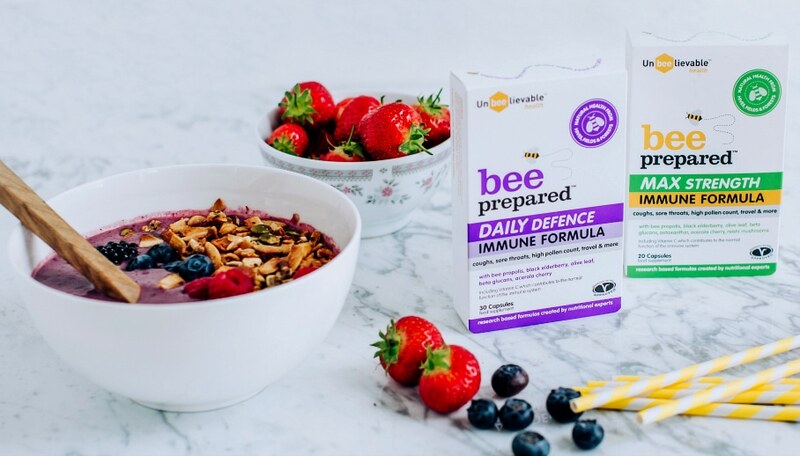 Take natural, plant extract immune support supplements like Bee Prepared Immune Formulas (contains beneficial ingredients not usually found in a regular diet), which will balance and support immune function without over stimulating it. Eat balanced meals and snacks regularly & avoid sugar. Eating meals with a combination of complex carbohydrates, quality vegetarian or lean animal proteins, and antioxidant rich vegetables. Having quality snacks between meals, such as hummus with vegetables or oatcakes, to maintain energy and balance insulin levels. Reduce stimulants like coffee which can increase insulin production. Avoid sugar. Try honey instead! Taking a brisk 20 minute walk each day. Opt to use the stairs or walking to destinations when you can.